Collage of views of Gdańsk. Gdańsk (German: Danzig) is a city on the Baltic coast in northern Poland, at the centre of the country's fourth-largest metropolitan area. The city lies on the southern edge of Gdańsk Bay (of the Baltic Sea), in a conurbation with the city of Gdynia, spa town of Sopot, and suburban communities, which together form a metropolitan area called the Tricity (Trójmiasto), with a population of over 800,000. Gdańsk itself has a population of 435,830 (June 2010), making it the largest city in the Pomerania region of Northern Poland. Gdańsk is Poland's principal seaport as well as the capital of the Pomeranian Voivodeship. It is also historically the largest city of the Kashubian region. The city is close to the former late medieval/modern boundary between West Slavic and Germanic lands and it has a complex political history with periods of Polish rule, periods of German rule, and extensive self-rule, with two spells as a free city. It has been part of modern Poland since 1945. Gdańsk is situated at the mouth of the Motława River, connected to the Leniwka, a branch in the delta of the nearby Vistula River, whose waterway system supplies 60% of the area of Poland and connects Gdańsk to the national capital in Warsaw. This gives the city a unique advantage as the centre of Poland's sea trade. Together with the nearby port of Gdynia, Gdańsk is also an important industrial centre. Historically an important seaport and shipbuilding centre, Gdańsk was a member of the Hanseatic League. The city was the birthplace of the Solidarity movement which, under the leadership of political activist Lech Wałęsa, played a major role in bringing an end to Communist rule across Central Europe. It is also the home and birthplace of Polish Prime Minister Donald Tusk, who is of Kashubian origin. The city's name is thought to originate from the Gdania River, the original name of the Motława branch on which the city is situated. Gdańsk and Gdania are considered to be derivations from the Gothic name of the area (Gutiskandja), however this has also been questioned. Like many other Central European cities, Gdańsk has had many different names throughout its history. The name of a settlement was recorded after St. Adalbert's death in 997 AD as urbs Gyddanyzc and later was written as Kdanzk (1148), Gdanzc (1188), Danceke (1228), Gdansk (1236, 1454, 1468, 1484, 1590), Danzc (1263), Danczk (1311, 1399, 1410, 1414–1438), Danczik (1399, 1410, 1414), Danczig (1414), Gdąnsk (1636). See also Names of European cities in different languages. listen). In English (where the diacritic over the "n" is frequently omitted) the usual pronunciation is /ɡəˈdænsk/ or /ɡəˈdɑːnsk/. listen). This name was also used in English until the end of World War II, and is still used in historical contexts. Other former English spellings of the name include Dantzig, Dantsic and Dantzic. 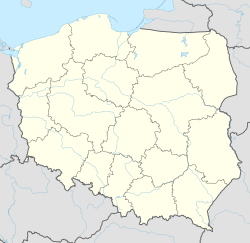 In the Kashubian language the city is called Gduńsk. The city's Latin name may be given as either Gedania, Gedanum or Dantiscum; the variety of Latin names reflects the mixed influence of the city's Polish, German and Kashubian heritage. Ceremonial names on special occasions the city is also referred to as "The Royal Polish City of Gdańsk" (Polish Królewskie Polskie Miasto Gdańsk, Latin Regia Civitas Polonica Gedanensis, Kashubian Królewsczi Polsczi Gard Gduńsk). Kashubians also use the name "Our Capital City Gdańsk" (Nasz Stoleczny Gard Gduńsk) or "The Kashubian Capital City Gdańsk" (Stoleczny Kaszëbsczi Gard Gduńsk). Regia Civitatis Gedanensis (Royal City of Gdańsk) coin of 1589, Sigismund III Vasa. Early settlements are associated with the Wielbark culture; after the Great Migrations, they were replaced by a Pomeranian settlement that probably dates back to the 7th century. In the 980s, a stronghold was built most probably by Mieszko I of Poland who thereby connected the Polish state ruled by the Piast dynasty with the trade routes of the Baltic Sea. The first written record of this stronghold is the vita of Saint Adalbert, written in 999 and describing events of 997. This date is generally regarded as the founding of Gdańsk in Poland; in 1997 the city celebrated the millennial anniversary of the year 997 when Saint Adalbert of Prague baptized the inhabitants of the settlement on behalf of Boleslaw the Brave of Poland. In the 12th century, the settlement became part of the Samborides' duchy and consisted of a settlement at the modern Long Market, craftmens' settlements along the Altstädter Graben ditch, German merchant settlements around the St Nicolas church and the old Piast stronghold. In 1186, a Cistercian monastery was set up in nearby Oliwa, which is now within the city limits. In 1215, the ducal stronghold became the centre of a Pomerelian splinter duchy. In 1224/25, Germans in the course of the Ostsiedlung established a settlement in the area of the earlier fortress. About 1235, the town was granted city rights under Lübeck law by Pomerelian duke Swantopolk II, an autonomy charter similar to that of Lübeck which was also the primary origin of many settlers. In 1300, the town had an estimated population of 2,000. While overall the town was not that an important trade centre at that time, it had some relevance in the trade with Eastern Europe. In 1308, the town was in rebellion and the Teutonic Knights were sent to restore order. Subsequently, they took over control the town. Medieval massacre records of 10,000 inhabitants are perceived divergently in modern literature: while sources state it as a fact, other sources discard it as a medieval exaggeration. Polish propaganda claims that the Knights then massacred the inhabitants. The alleged massacre was used as evidence by the Polish crown in a subsequent papal lawsuit. The knights colonized the area, replacing local Kashubians with German settlers. In 1308, they founded Osiek Hakelwerk near the town, initially as a Slavic fishing settlement. In 1340, the Teutonic Knights built a large fortress, which became the seat of the knights' Komtur. In 1343, they founded Rechtstadt, which in contrast to the pre-existing town (thence Altstadt, "Old Town" or Stare Miasto) was chartered with Kulm Law. 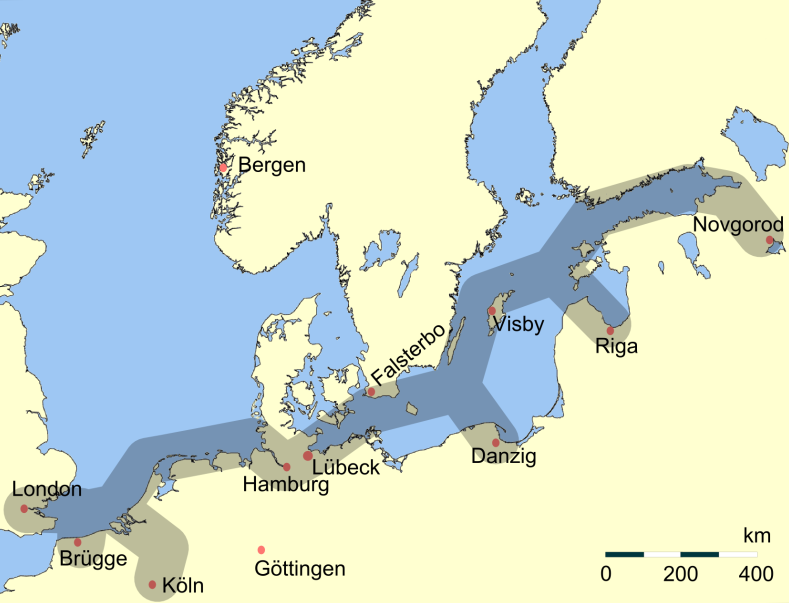 In 1358, Danzig joined the Hanseatic League, and became an active member in 1361. It maintained relations with the trade centres Brügge, Novgorod, Lisboa and Sevilla. In 1377, the Old Town's city limits were expanded. In 1380, Neustadt ("New Town" or "Nowe Miasto") was founded as the fourth, independent settlement. After a series of Polish-Teutonic Wars, in the Treaty of Kalisz (1343) the Order had to acknowledge that it would hold Pomerelia as an alm from the Polish Crown. Although it left the legal basis of the Order's possession of the province in some doubt, the city thrived as a result of increased exports of grain (especially wheat), timber, potas, tar, and other goods of forestry from Prussia and Poland via the Vistula River trading routes, despite the fact that after its capture, the Teutonic Knights tried to actively reduce the economic significance of the town. While under the control of the Teutonic Order German migration increased. A new war broke out in 1409, ending with the Battle of Grunwald (1410), and the city came under the control of the Kingdom of Poland. A year later, with the first First Peace of Thorn, it returned to the Teutonic Order. In 1440, the city participated in the foundation of the Prussian Confederation which was an organization opposed to the rule of the Teutonic Knights. This led to the Thirteen Years' War of independence from the Teutonic Monastic State of Prussia (1454–1466). This intermittent warfare ended on May 25, 1457, when the city - jointly with Royal Prussia - became part of the Crown of Poland while maintaining its rights and independence as an autonomous city. On 15 May 1457, Casimir IV of Poland granted Danzig the Great Privilege (German: Großes Privileg), after he had been invited by the town's council and had already stayed in town for five weeks. With the Great Privilege, the town was granted autonomy from Poland. The privilege confirmed to the town independent jurisdiction, legislation and administration of her territory, and the rights of the Polish crown were limited to the following: The Polish king was allowed to stay in town for three days a year, he was further allowed to choose a permanent envoy from eight councilmen proposed to him by the town, and received an annual payment, the Gefälle. Furthermore, the privilege united Old Town, Hakelwerk and Rechtstadt, and legalized the demolition of New Town, which had sided with the Teutonic Knights. Already in 1457, New Town was demolished completely, no buildings remained. Gaining free and privileged access for the first time to Polish markets, the seaport prospered while simultaneously trading with the other Hanseatic cities. After the Second Peace of Thorn with the Teutonic Monastic State of Prussia the warfare between the latter and the Polish crown ended permanently. After the incorporation of Royal Prussia by the Kingdom of Poland in 1569, the city continued to enjoy a large degree of internal autonomy (cf. Danzig Law). King Stephen Báthory's attempt to subject the city, which had supported Maximilian II in the prior election of the king, failed. The city, encouraged by its immense wealth and almost impregnable fortifications, as well as by the secret support of Denmark and Emperor Maximilian, shut its gates against Stephen. After the Siege of Danzig, lasting six months, the city's army of 5,000 mercenaries was utterly defeated in a field battle on December 16, 1577. However, since Stephen's armies were unable to take the city by force, a compromise was reached: Stephen Báthory confirmed the city's special status and her Danzig Law privileges granted by earlier Polish kings. The city recognised him as ruler of Poland and paid the enormous sum of 200,000 guldens in gold as payoff ("apology"). The city suffered a slow economic decline due to the wars of the 18th century, when it was taken by the Russians after the Siege of Danzig in 1734. Danzig was annexed by the Kingdom of Prussia in 1793. During the era of Napoleon Bonaparte the city became a free city in the period extending from 1807 to 1814. After France's defeat in the Napoleonic Wars it again became part of Prussia and became the capital of Regierungsbezirk Danzig within the province of West Prussia from 1815. The city's longest serving Regierungspräsident was Robert von Blumenthal, who held office from 1841, through the revolutions of 1848, until 1863. The city became part of the German Empire in 1871. When Poland regained its independence after World War I with access to the sea as promised by the Allies on the basis of Woodrow Wilson's "Fourteen Points" (point 13 called for "an independent Polish state", "which should be assured a free and secure access to the sea"), the Poles hoped the city's harbour would also become part of Poland. However, since Germans formed a majority in the city, with Poles being a minority (in the 1923 census 7,896 people out of 335,921 gave Polish, Kashubian or Masurian as their native language, but Polish estimates of the Polish minority during the interwar era range from 37.000 to 100.000 (9%-34%)), the city was not placed under Polish sovereignty. Instead, in accordance with the terms of the Versailles Treaty, it became the Free City of Danzig, an independent quasi-state under the auspices of the League of Nations with its external affairs largely under Polish control. Poland's rights also included free usage of the harbour, a Polish post office, a garrison in Westerplatte district, customs union with Poland etc. This led to a large degree of tension between the city and the surrounding Republic of Poland. The Free City had its own constitution, national anthem, parliament (Volkstag), and government (Senat). It issued its own stamps as well as currency. German Nazi poster: "Danzig is German". The German population of the Free City of Danzig favored reincorporation into Germany. In the early 1930s the local Nazi Party capitalized on these pro-German sentiments and in 1933 garnered 50% of vote in the parliament. Thereafter, the Nazis under Gaulleiter Albert Forster achieved dominance in the city government, which was still nominally overseen by the League of Nations' High Commissioner. The German government officially demanded the return of Danzig to Germany along with an extraterritorial (meaning under German jurisdiction) highway through the area of the Polish Corridor for land-based access between those parts of Germany. Hitler used the issue of the status city as pretext for attacking Poland and on May 1939, during a high level meeting of German military officials explained to them: It is not Danzig that is at stake. For us it is a matter of expanding our Lebensraum in the east, adding that there will be no repeat of Czech situation, and Germany will attack Poland at first opportunity, after isolating the country from its Western Allies. As Nazi demands increased, German-Polish relations rapidly deteriorated. Germany invaded Poland on September 1 after having signed a non-aggression pact with the Soviet Union in late August. The German attack began in Danzig, with a bombardment of Polish positions at Westerplatte by the German battleship Schleswig-Holstein, and the landing of German infantry on the peninsula. Outnumbered Polish defenders at Westerplatte resisted for seven days before running out of ammunition. Meanwhile, after a fierce day-long fight (1 September 1939), defenders of the Polish Post office were murdered and buried on the spot in the Danzig quarter of Zaspa in October 1939. To celebrate the surrender of Westerplatte, the NSDAP organized a night parade on September 7 along the Adolf-Hitlerstrasse that was inadvertently attacked by a Polish hydroplane taking off from Hel Peninsula. The city was officially annexed by Nazi Germany and incorporated into the Reichsgau Danzig-West Prussia. "Danzig is German". Postage stamp issued by Nazi Germany to celebrate the incorporation of Danzig into Germany after the invasion of Poland. About 50 percent of members of the Jewish Community of Danzig had left the city within a year after a Pogrom in October 1937, after the Kristallnacht riots in November 1938 the community decided to organize its emigration and in March 1939 a first transport to Palestine started. By September 1939 barely 1,700 mostly elderly Jews remained. In early 1941 just 600 Jews were still living in Danzig who were later murdered in the Holocaust. Out of the 2,938 Jewish community in the city 1,227 were able to escape from the Nazis before the outbreak of war.Nazi secret police had been observing Polish minority communities in the city since 1936, compiling information, which in 1939 served to prepare lists of Poles to be captured in Operation Tannenberg. On the first day of the war, approximately 1,500 ethnic Poles were arrested, some because of their participation in social and economic life, others because they were activists and members of various Polish organizations. On September 2, 1939, 150 of them were deported to the Stutthof concentration camp some 30 miles from Danzig, and murdered. Many Poles living in Danzig were deported to Stutthof or executed in the Piaśnica forest. In 1941, the German government ordered the invasion of the Soviet Union, eventually causing the fortunes of war to turn against it. As the Soviet Army advanced in 1944, German populations in Central and Eastern Europe took flight, resulting in the beginning of a great population shift. After the final Soviet offensive began in January, 1945, hundreds of thousands of German refugees, many of whom had fled to Danzig on foot from East Prussia (see evacuation of East Prussia), tried to escape through the city's port in a large-scale evacuation involving hundreds of German cargo and passenger ships. Some of the ships were sunk by the Soviets, including the Wilhelm Gustloff after an evacuation was attempted at neighboring Gdynia. In the process, tens of thousands of refugees were killed. The city also endured heavy Allied and Soviet bombardment by air. Those who survived and could not escape encountered the Soviet Army, which captured the city on March 30, 1945. The city was heavily damaged. In line with the decisions made by the Allies at the Yalta and Potsdam conferences, the city became part of Poland. The remaining German residents of the city who had survived the war fled or were forcibly expelled to postwar Germany, and the city was repopulated with ethnic Poles, many of whom had been deported by the Soviets in two major waves from Polish areas annexed by the Soviet Union, i.e. from the eastern portion of pre-war Poland. The historic old city of Gdańsk, which had suffered large-scale destruction at the hands of the Soviet Army, was rebuilt during the 1950s and 1960s. Boosted by heavy investment in the development of its port and three major shipyards for Soviet ambitions in the Baltic region, Gdańsk became the major shipping and industrial centre of the Communist People's Republic of Poland. In December 1970, Gdańsk was the scene of anti-regime demonstrations, which led to the downfall of Poland's communist leader Władysław Gomułka. During the demonstrations in Gdansk and Gdynia, military as well as the police opened fire on the demonstrators causing several dozen deaths. Ten years later, on August 31, 1980, Gdańsk Shipyard was the birthplace of the Solidarity trade union movement, whose opposition to the Communist regime led to the end of Communist Party rule in 1989, and sparked a series of protests that successfully overturned the Communist regimes of the former Soviet bloc. Solidarity's leader, Lech Wałęsa became President of Poland in 1990. Gdańsk native Donald Tusk became Prime Minister of Poland in 2007. Today Gdańsk is a major shipping port and tourist destination and has been the setting for a number of major open air concerts, including Pink Floyd's David Gilmour and Jean Michel Jarre. The Rock band Queen staged a concert in the Shipyard in October 2008. Gdansk enjoys a temperate climate, with cold, cloudy, moderate winters and mild summers with frequent showers and thunderstorms. Average temperatures range from -1.0 to 17.2 °C (30 to 63 °F) and rainfall varies from 31.0 mm/month to 84.0 mm/month. In general it is a maritime climate and therefore damp, variable and mild. The seasons are clearly differentiated. Spring starts in March and is initially cold and windy, later becoming pleasantly warm and often very sunny. Summer, which begins in June, is predominantly warm but hot at times (with temperature reaching as high as 30-35C at least once per year) with plenty of sunshine interspersed with heavy rain. The average annual hours of sunshine for Gdansk are 1600, similar to other Northern cities. July and August are the hottest months. Autumn comes in September and is at first warm and usually sunny, turning cold, damp and foggy in November. Winter lasts from December to March and includes periods of snow. January and February are the coldest months with the temperature sometimes dropping as low as −15 °C (5 °F). The industrial sections of the city are dominated by shipbuilding, petrochemical and chemical industries, and food processing. The share of high-tech sectors such as electronics, telecommunications, IT engineering, cosmetics and pharmaceuticals is on the rise. Amber processing is also an important part of the local economy, as the majority of the world's amber deposits lie along the Baltic coast. The Pomeranian Voivodeship, including Gdańsk, is also a major tourist destination in the summer months, as millions of Poles and European Union citizens flock to the beaches of the Baltic coastline. Neptune's Fountain in the centre of the Long Market, a masterpiece by a Dutch architect Abraham van den Blocke, 1617. St Mary (Bazylika Mariacka), a municipal church built during the 15th century, is the largest brick church in the world. Gdańsk tram - Bombardier NGT6. Obwodnica Trojmiejska - part of expressway S6 that bypasses the cities of Gdańsk, Sopot and Gdynia. Train transportation provides connections with all major Polish cities, and with the neighbouring Kashubian Lakes region. The A1 motorway connects the port and city of Gdańsk with the southern border of the country. There are many popular professional sports teams in the Gdańsk and Tricity area. Amateur sports are played by thousands of Gdańsk citizens and also in schools of all levels (elementary, secondary, university). On the right side the picture is showing the Construction that is in process for the Euro 2012 the stadium will hold a capacity of 44,000 seats. The city's professional football club is Lechia Gdansk. Founded in 1945, they play in the Ekstraklasa, Poland's top division. Their home stadium, Stadion Lechii, will be replaced by the under-construction PGE Arena, one of the four Polish stadia to host the UEFA Euro 2012 competition. Contemporary Gdańsk is the capital of the province called Pomeranian Voivodeship and is one of the major centres of economic and administrative life in Poland. Many important agencies of the state and local government levels have their main offices here: the Provincial Administration Office, the Provincial Government, the Ministerial Agency of the State Treasury, the Agency for Consumer and Competition Protection, the National Insurance regional office, the Court of Appeals, and the High Administrative Court. Gdańsk Voivodeship was extended in 1999 to include most of former Słupsk Voivodeship, the western part of Elbląg Voivodeship and Chojnice County from Bydgoszcz Voivodeship to form the new Pomeranian Voivodeship. The area of the region was thus extended from 7,394 km² to 18,293 km² and the population rose from 1,333,800 (1980) to 2,198,000 (2000). By 1998, Tricity constituted an absolute majority of the population; almost half of the inhabitants of the new region live in the centre. There are 14 universities with a total of 60,436 students, including 10,439 graduates as of 2001. Kimmich, Christoph M, (1968). The free city: Danzig and German foreign policy, 1919-1934. Yale University Press, New Haven, Connecticut. http://books.google.com/books?id=-3VxQgAACAAJ. Retrieved 8 March 2010. Rudziński, Grzegorz (1 March 2001). Gdańsk. Bonechi. ISBN 9788847605176. http://books.google.com/books?id=9AKfPQAACAAJ. Retrieved 26 February 2010. Simson, Paul (October 2009). Geschichte Der Stadt Danzig. BiblioBazaar, LLC. ISBN 9781115532563. http://books.google.com/books?id=DSmxtiBx4CoC. Retrieved 26 February 2010. ^ a b "Poland - largest cities (per geographical entity)". World Gazetteer. http://world-gazetteer.com/wg.php?x=&men=gcis&lng=en&des=gamelan&geo=-173&srt=npan&col=abcdefghinoq&msz=1500&pt=a&va=&srt=pnan. Retrieved 2009-05-05. ^ Room. Placenames of the World, (2nd Ed ed.). Google Books. http://books.google.se/books?id=M1JIPAN-eJ4C&pg=PA142&lpg=PA142&dq=gda%C5%84sk+%22gothic+name%22&source=web&ots=idosJ5LU_M&sig=s2TpjJe3SgAaHy7E4M086LOheVY&hl=sv. Quote: "The city has a Gothic name, from Gutisk-andja, "end of the Goths," as these people's territory extended to here. The city's former German name, Danzig, misleadingly suggests an association with the Danes." ^ Green, Dennis H. The Visigoths from the Migration Period to the Seventh Century. Google Books. Quote: "...the difficulty with Gdańsk, Gdynia and gudas... in the Polish coastal area centuries before the Goths are known to have occupied this region... casts doubt on the theory of Gothic origin." ^ a b Tighe, Carl (1990). Gdańsk: national identity in the Polish-German borderlands. Pluto Press. http://books.google.com/books?id=MkBpAAAAMAAJ&q=Gyddanyzc&dq=Gyddanyzc. ^ (in German) Handbuch der polnischen Siegelkunde. 1966. http://books.google.com/books?id=VfEeAAAAMAAJ&dq=%22Zwantepolc+de%22&q=Zwantepolc&pgis=1#search. ^ World and ist people. Google Books. http://books.google.de/books?id=aMEnNczUZLsC&pg=PA1137&dq=danzig+majority+germans&hl=de&ei=PfxWTLLrGcOsOMfl2J4O&sa=X&oi=book_result&ct=result&resnum=3&ved=0CDYQ6AEwAg#v=onepage&q=danzig%20majority%20germans&f=false. Retrieved 9 October 2010. ^ "Encyclopedia Brittanica". Encyclopedia Brittanica (11 ed.). 1911. http://www.1911encyclopedia.org/Danzig. ^ a b c Hess, Corina (2007). Danziger Wohnkultur in der frühen Neuzeit. Berlin-Hamburg-Münster: LIT Verlag. p. 40. ISBN 3825887111. ^ a b Hess, Corina (2007). Danziger Wohnkultur in der frühen Neuzeit. Berlin-Hamburg-Münster: LIT Verlag. p. 39. ISBN 3825887111. ^ a b Hess, Corina (2007). Danziger Wohnkultur in der frühen Neuzeit. Berlin-Hamburg-Münster: LIT Verlag. pp. 40–41. ISBN 3825887111. ^ a b c d e f Hess, Corina (2007). Danziger Wohnkultur in der frühen Neuzeit. Berlin-Hamburg-Münster: LIT Verlag. p. 41. ISBN 3825887111. ^ Hess, Corina (2007). Danziger Wohnkultur in der frühen Neuzeit. Berlin-Hamburg-Münster: LIT Verlag. pp. 41–42. ISBN 3825887111. ^ a b Hess, Corina (2007). Danziger Wohnkultur in der frühen Neuzeit. Berlin-Hamburg-Münster: LIT Verlag. p. 42. ISBN 3825887111. ^ (English) The North Sea and culture (1550-1800): proceedings of the international conference held at Leiden 21–22 April 1995. Uitgeverij Verloren. 1996. p. 103. ISBN 90-65505-27-X. http://books.google.pl/books?id=XeDxJ0g5AokC&printsec=frontcover. ^ (Polish) "Zielona Brama w Gdańsku". wilanowmiasta.gazeta.pl. 2007-02-18. http://miasta.gazeta.pl/trojmiasto/1,49422,3928314.html. Retrieved 2008-12-29. ^ a b c Hess, Corina (2007). Danziger Wohnkultur in der frühen Neuzeit. Berlin-Hamburg-Münster: LIT Verlag. p. 45. ISBN 3825887111. ^ Hess, Corina (2007). Danziger Wohnkultur in der frühen Neuzeit. Berlin-Hamburg-Münster: LIT Verlag. p. 45. ISBN 3825887111. : "Geben wir und verlehen unnsir Stadt Danczk das sie zcu ewigen geczeiten nymands for eynem herrn halden noc gehorsam zcu weszen seyn sullen in weltlichen sachen." ^ (Polish) "The Main Town Hall". www.mhmg.gda.pl. http://www.mhmg.gda.pl/international/?lang=eng&oddzial=1. Retrieved 2008-12-29. ^ (in German) Ergebnisse der Volks- und Berufszählung vom 1. November 1923 in der Freien Stadt Danzig. Verlag des Statistischen Landesamtes der Freien Stadt Danzig. 1926. ^ Translation: The postage seal reads: "Danzig greets joyously her leader and liberator, Adolf Hitler." ^ Bauer, Yehuda (1981). American Jewry and the Holocaust. Wayne State University Press. p. 145. ISBN 0-8143-1672-7. http://books.google.com/books?id=WOd3rLul-LcC&pg=PA145&dq=jewish+danzig&hl=de&ei=Rn9VTLz5MsiN4gaw1qWnBQ&sa=X&oi=book_result&ct=result&resnum=4&ved=0CDkQ6AEwAzg8#v=onepage&q=jewish%20danzig&f=false. ^ Museums Stutthof in Sztutowo. Retrieved January 31, 2007. ^ (English) Beautiful historic Gdańsk. Excalibur. 1995. p. 769. http://books.google.pl/books?id=18O1AAAAIAAJ&pgis=1. ^ A history of architecture. Baker & Taylor. 1915. p. 293. http://books.google.pl/books?id=Inw3AAAAIAAJ&pgis=1. ^ (English) Poland. Nagel. 1964. p. 302. http://books.google.pl/books?id=uXu0AAAAIAAJ&pgis=1. ^ ROBiDZ w Gdańsku. "Kaplica Królewska w Gdańsku" (in Polish). www.wrotapomorza.pl. http://www.wrotapomorza.pl/pl/kultura/zabytki/wybrane_zabytki/kosciol/krolewska. Retrieved 2008-12-29. ^ "The Gdańsk Institute for Market Economics". Web.archive.org. Archived from the original on 2008-02-09. http://web.archive.org/web/20080209112613/http://www.ibngr.edu.pl/english/index2.htm. Retrieved 2009-07-25. ^ a b c d e f g h i j k l m n o p q r s t "Gdańsk Official Website: 'Miasta partnerskie'" (in Polish & English). © 2009 Urząd Miejski w Gdańsku. http://www.gdansk.pl/samorzad,62,733.html. Retrieved 2009-07-11.